For the past three Novembers, Jefferson Township has been the location of a Household Hazardous Waste and Computer/TV Drop-Off Event sponsored by the Morris County Municipal Utilities Authority (MCMUA). That’s because Gino Recksiek, Jefferson Township recycling coordinator, wrote a letter several years ago requesting that Jefferson be the site for such an event, and it came to fruition. “I feel so good about this because the county has afforded residents of Jefferson and the surrounding area a tremendous opportunity to dispose of hazardous waste and electronics conveniently and properly,” says Gino, the host with the most! By the way, the next HHW event in Jefferson is scheduled for this Sunday, November 5, between 9:00 a.m. and 2:00 p.m.
Bruce Hoppe and Robert Young have been friends ever since 1956 or so when they became members of the Cub Scout den in East Orange for which Bruce’s mom served as den mother. Over the years they’ve worked together on restoring Triumph sports cars, and they’ve volunteered for many hours at Pedals for Progress bicycle collection events. Indeed, both have volunteered at Pedals events that the MCMUA co-sponsored. “This is an economic development program because people are trained as mechanics so that they can fix the bicycles up after they reach developing countries. It’s great that folks in those countries have access to non-polluting transportation,” Bruce opines. “Collecting used bikes is a great concept. Recently we picked up a bike in Long Hill that came from a bike store in Albany. A woman who hailed from Czechoslovakia used it when she lived in Long Hill. Now instead of heading for a landfill, it’s en route to someone who desperately needs it,” adds Robert. “She’s brought recycling in East Hanover to a new level. She’s visited businesses in town, has been responsible for our accepting new materials at the recycling center and for expanding the hours of operation at the center,” says Marc Macaluso, East Hanover co-recycling coordinator. “She” is Chris Vidal, who serves not only as the relatively new co-recycling coordinator but also as East Hanover Clean Communities coordinator. “The best part of the job is meeting different people and acquiring ideas from them. Also, I love to send articles and photos to the newspaper,” Chris affirms. On October 18 at the commencement ceremony for the New Jersey Recycling Certification Series, Chris received the designation of Certified Recycling Professional. She says that because of networking done at the certification series classes, East Hanover is now collecting metal at its recycling center. “People seem to be very interested in recycling, and serving as a co-recycling coordinator has opened up a whole new world for me,” a very enthusiastic Chris says. “I remember collecting aluminum foil chewing gum liners during World War II. I wore hand-me-downs from my sister – hello! I spent some time living on a farm, learning about ecology and watching animals grow. 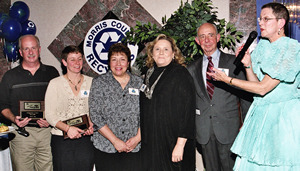 A healthy environment pays off; we must have green places,” remarks Judy Schleicher, the dark-haired, bubbly Morris County version of Judy Garland. 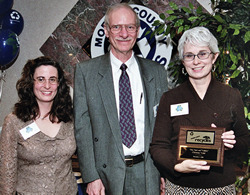 Judy has a long herstory of involvement in Morris County environmental endeavors, ranging from serving on the Denville Planning Board (where she was introduced to water issues) to presiding over both McRides (a transportation management association) and Protect Our Wetland, Water and Woods (a land trust that recently applied for funding to acquire Hog Pen Rock, a tract of “historically significant” land in Denville). Judy devotes considerable time right now to her duties as vice president of the Morris County Park Commission for whom land preservation and stewardship of that land are top priorities. If you’re curious as to how scraps of L’Eggs pantyhose evolve into Frisbees or geode balls, just ask Mary-Ann Lewis, program coordinator for the Morris Area Girl Scout Council (MAGSC). Mary-Ann has created those items as well as volleyball nets from used plastic beverage carrier rings and scoop catchers from gallon-sized milk jugs. She’s also taught Girl Scouts themselves how to make and use this kind of sports equipment. Three cheers for reuse! In addition, Mary-Ann has been instrumental in having MAGSC partner with the MCMUA in the Adopt the Alamatong Wellfield project through which Girl Scouts learn about the wellfield from Michelle Burke, MCMUA environmental specialist, and then venture into the wellfield to pull up invasive vegetation such as Russian olive trees. Because the Russian olive tree is a monoculture, its presence reduces biodiversity in the area − that’s not good! Several Girl Scouts who have become Alamatong Wellfield experts and have spent at least 15 hours laboring there, will receive their badges this evening. 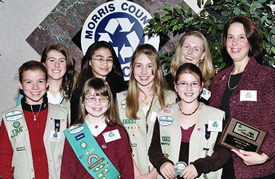 Girl Scouts Sara Gabel, Maxine Gates, Karen Hao, Erica Higdon. 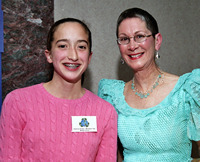 Kerriann O’Boyle, Becky Snelson, Emily Snyder were recipients of Adopt the Alamatong badges. The list is quite long. 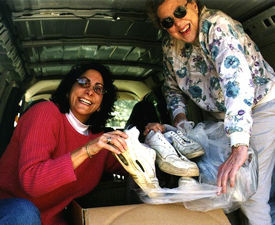 At the top (or the head, if you will) is the annual collection of used eyeglasses, with more than 600 pairs garnered in 2004 and 2005. At the bottom (or the toe, if you will) is the autumn 2004 collection of over 600 pairs of used sneakers that were then recycled through the Nike Reuse-A-Shoe program. 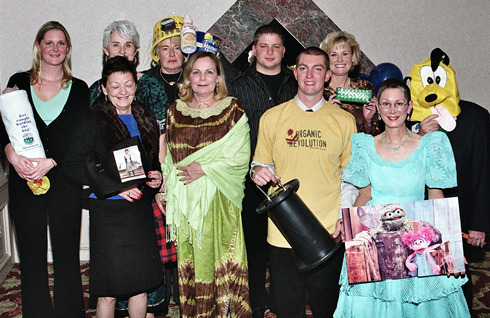 When Barbara McCloskey, president, says that the club is committed to recycling and conservation efforts, she is most serious. Herewith a few of the projects that the club has been involved with: 1) overseeing the collection and recycling of plastic beverage carrier rings at two local recycling centers (more than 136,262 carriers have been diverted from the landfill so far; 2) the collection of over 200 used ink-jet cartridges, with the proceeds from their sale going to a local land trust, and; 3) the collection of more than 35,000 children’s books that have been distributed to foster families in Morris County and schools in Dover, Irvington, Newark and Paterson. These ongoing projects have been a part of the Denville Woman’s Club mission for at least 50 years, and they have certainly contributed toward a better environment. 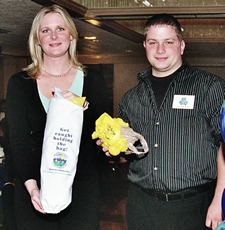 “It amazes me as to how much litter is out there,” reflects Jim DiRienzo, cubmaster of the pack. “Having participated in several litter cleanups, the Cubs have learned how to protect the environment and help their community, too.” Cub Pack 249 employs a highly organized and effective routine for collecting trash and recyclables during its cleanups – such a laudable way of doing so, that their operation should be filmed in order that prospective cleaner-uppers can learn from the pros, according to Liz Sweedy, Morris County Clean Communities coordinator. This evening we’ll have the special treat of observing a few of the Cubs as they demonstrate their plan it, pick it, pack it skills. “It was a wonderful opportunity to understand policy-making and to learn how we could make decisions that affect policy. Also, it allowed me to be active in my community and to express my views,” says Delphine Slotten, who participated in We the People: Project Citizen during the 2005-2006 school year. Currently an eighth-grader at Mendham Township Middle School, Delphine created a portfolio related to identifying a problem (in this case, a less than stellar school recycling program) and trying to manage the problem (it’s good to have recycling containers inside and outside the school building), by creating a new policy or amending an old one. On May 19, 2006, Delphine presented the portfolio to a panel of judges at Rutgers University, and it was awarded first place in the portfolio category. As a result of being immersed in this project, Delphine learned that Kermit the Frog’s oft-quoted observation is so true: It’s not easy being green. But she learned, too, that individual citizens do have the power to make things better. “Mary was a multi-faceted student who excelled academically. She was involved in a variety of endeavors: modern dance, theatre and the environmental club,” according to Barbara Ford, Mary’s guidance counselor at Hanover Park High School, from which Mary graduated in 2006. Also, Mary excelled at being patient and persistent when she was a Hanover Park student. Dissatisfied with the state of the school recycling program, she consulted with MCMUA employees and visited our offices to acquire decals and other materials to use in a back-to-school display; wrote a letter to the principal; met with the business administrator; worked with the environmental club to raise money for the purchase of containers, and; tried to determine how to fit containers for recyclable bottles and cans into a limited area on the school property (her dad even measured the area and constructed blueprints accordingly). 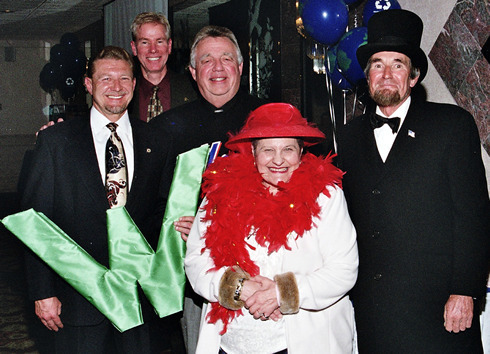 She did see some progress but would like to have seen much more: “I’d like to see an informed school and a sufficient recycling program.” Though she was a pillar of persistence, Mary also learned that it’s not easy being green. This foursome keeps recycling in the forefront at Riverview School in Denville. Diane Burton, the principal, got the ball rolling a while back, but there were a few false starts. Along the way, first grade teacher Mary Ellen Coiro worked with the PTA to acquire recycling containers for the classrooms. Science teacher Kris Johnson coordinated an outdoor Earth Day recycling relay, and she orchestrated having the musical group Mad Agnes visit the school for a full day to help the children compose a song that begins “We are the guardians of the Earth. We must recycle. We live on a breathing planet. If we don’t take care of her, nobody will.” Head custodian Paul Kruger, who says he loves working with the people at Riverview, makes sure that recyclables are properly prepared and put outside in front of the school for collection every Monday by the MCMUA curbside crew. In addition to having an exemplary recycling program, the school has a butterfly garden where the children have been actively involved. “You’re only borrowing the environment from your children” is one of Michael Degen’s favorite sayings. He recalls first hearing it when he was 12 or 13 years old. As a result, Michael, who is manager of environmental health and safety at the relatively new Cadbury Schweppes Science & Technology Center in Hanover Township, wanted the facility to be in compliance with local recycling regulations when it opened. Although the bid specifications for recycling collection required that bottles and cans be accepted along with paper, the hauler who was awarded the bid wanted nothing to do with bottles and cans. Hmm…. Thus, Michael did some research and eventually arranged for the MCMUA to collect the bottles and cans, but the hauler who picks up the paper is assessed a fee for the service provided by the MCMUA. The Cadbury Schweppes facility is the only one of its kind in the United States; it includes a pilot plant where product development is a key component. Mike, who makes sure that all waste material is properly managed, pointed out that Penn Jersey Farms picks up 45,000 pounds of gum base every three weeks to be used as fodder for pigs; however, the persnickety pigs absolutely turn their snouts up at raw gum base − they devour flavored gum base only, thank you very much! 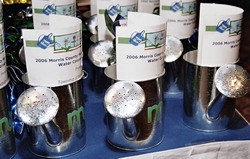 The silvery watering cans that feature the blue and green MCMUA logo will remind their recipients that they have done considerable good for Mother Earth. By adopting or amending ordinances, these municipalities have restricted the watering of lawns and the washing of cars, driveways and sidewalks. Indeed, in one case, a municipality has restricted all outdoor use of water to certain times of the day. Farewell and fare well to Cecilia Laureys and Frank Druetzler, who will leave the Morris County Board of Chosen Freeholders at the end of this year. 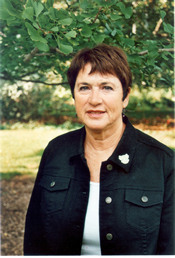 When Cecilia (known as “Cissy” to most of us) was elected a freeholder, the county was pursuing the development of a waste-to-energy facility and landfill in Morris County. Prior to creating these plans, the county had initiated recycling programs, but Cissy vigorously pushed for the effort to recycle even more of the solid waste stream, including additional materials. 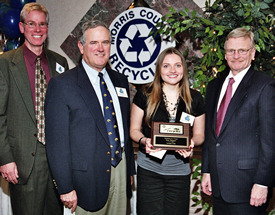 The county and its municipalities followed this lead and built a strong recycling system, which has been recognized as one of the best in the state. Cissy’s focus and tenacity have prevailed for many years. 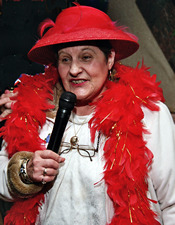 She is one of the strongest proponents of recycling, and we trust that she’ll continue to spread the recycling gospel as a member of the Red Hat Society. 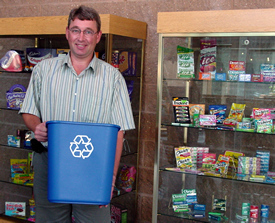 Frank, too, was and still is a strong supporter of recycling programs and systems. 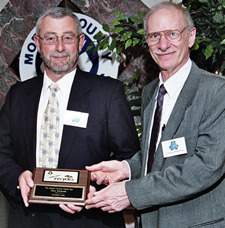 When he entered the scene, he questioned the direction Morris County was pursuing (waste-to-energy and landfill) and re-directed efforts to pursue alternate waste management technologies, including composting and increased recovery systems. 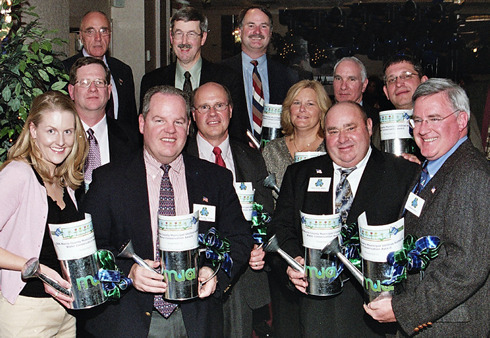 Frank served as freeholder liaison to the MCMUA for many years. 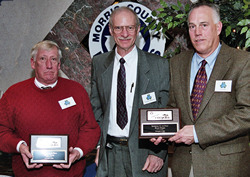 Perhaps Frank’s largest contribution was his business savvy, as he was key to Morris County’s purchasing the two transfer stations from the private company that owned them. This not only gave the county control over management of solid waste, but also contributed to significant reductions in solid waste costs, which saved Morris County residents millions of dollars. This control provided the county with the opportunity to develop and finance the award-winning recycling programs we now utilize and recognize here tonight. 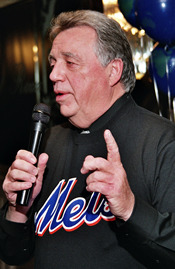 For his noteworthy efforts, Frank is being inducted into the Mets Fans Hall of Fame. As usual, Leeza Tea Coco Chanel, MCMUA designer-in-residence, has created an elegant dress called REB for its color: robin’s egg blue. The “fabric” that constitutes the outer layer of REB is Crate & Barrel packing material that was used in cartons containing wedding gifts for the daughter of an MCMUA employee. Robin’s egg blue is also one of the colors on the dress worn by Abby Cadabby, the adorable three-year-old fairy who debuted on Sesame Street on August 14. Two of the women’s outfits being modeled were made in Uganda with sewing machines that Pedals for Progress delivered there, as was a handbag that was made in Moldova. Both the mustard-colored Organic Revolution tee shirt and the blue, green and silver clutch handbag made from recycled candy wrappers, soft drink labels and food packages, are available at the Organic Nest, 17 Olcott Square in Bernardsville. Accessories similar to those presented as a farewell/fare well gift to Freeholder Cecilia Laureys are available at Taylor’s Consignors, 752 Speedwell Avenue in Morris Plains. Miranda McMua, named for the character whom Cynthia Nixon portrayed on an HBO show about life in New York City, as well as for the organization hosting this dinner, has been dressed by Liz Sweedy in garb that is directly related to the theme of tonight’s dinner. Do you see the relationship? Thanks to the following for their donations: 1) Cadbury Schweppes – confections; 2) Atlantic Coast Fibers, Inc., - two tickets to the December 16 New Jersey Devils vs. Detroit hockey game, and a reserved parking ticket; 3) Marcal Paper Mills, Inc. – two gift boxes, and; 4) Mendham Books – In the Beat of a Heart: Life, Energy and the Unity of Nature by John Whitfield. For the 12th consecutive year, Shot of Redemption is providing live music. To book Shot of Redemption for an event, call 845-255-3177. In addition, Analog (as opposed to Digital) Ramblers will provide a musical interlude. The quartet consisting of Eric Kellner, Larry Maltz, Derek Polzer and John Vadnais first met at the Chatham/Summit Friends (Quakers) Meeting, and they’ve had lots of fun jamming. Fifteen large sheet cakes in a row. Add this year’s and that makes 16, the number baked and decorated by MCMUA Chairman Herman (“Hy”) Nadel, a.k.a. the Cake Man, for our dinners. Hy is a sweetheart! Please leave the floral arrangement on your table at the conclusion of the event unless you’ve been told to take it home. The arrangements that have not been designated for specific guests will travel to Morris View Nursing Home tomorrow to brighten the lives of some of its residents.